Receipt, 7" x 5", for premium ($13) paid by Aaron Smith Jr. to the Conway Mutual Fire Insurance Company of Conway, Mass. on May 27, 1851. Signed by W.E. Shumway, Agent. Conway Mutual Fire Insurance Company, Conway, Mass. C.A. Mirick, Printer, Greenfield, Mass. Conway Mutual Fire Insurance Company, Conway, Mass. 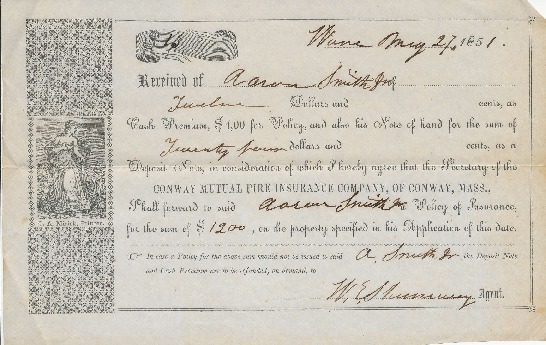 , “Conway Mutual Fire Insurance Policy Premium Receipt,” Conway Historical Society, accessed April 21, 2019, http://conwaymasshistory.org/items/show/864.